Thanks to the London Film Festival, I have a uniquely skewed perspective on the career of Chinese director Jia Zhang-Ke. I’ve seen two of his movies there – his 2004 drama The World, and his 2010 documentary I Wish I Knew – in what would turn out to be among the very few screenings they ever received in the UK. And I’ve even briefly been in the same room as the man himself, when in 2000 he attended an LFF panel on the challenges facing Asian independent filmmakers. But his famous films – the ones that made his reputation, and actually got a proper cinema release over here – well, somehow those have eluded me over the years. So just in time for Christmas, Artificial Eye have repackaged the three films that introduced Jia Zhang-Ke to the world: the loosely-related collection that’s nowadays referred to as The Hometown Trilogy. As the title suggests, the thing that ties these three stories together is a sense of place. They’re all set in the northern Chinese province of Shanxi (the first two specifically in Jia’s own hometown of Fenyang), and spread across three turbulent decades in Chinese history, from the eighties to the noughties. During that time, the so-called Fifth Generation of Chinese directors was largely focused on the country’s past. Jia was part of the Sixth Generation – a group of filmmakers who wanted to concentrate on contemporary themes. After the lush period dramas of the likes of Zhang Yimou and Chen Kaige, this was China’s equivalent of the US independent cinema boom of the late ’80s. 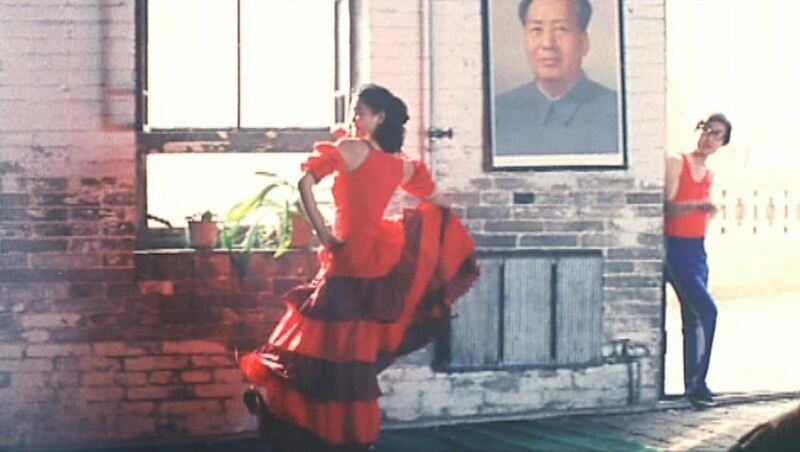 Xiao Wu (1997) was Jia’s debut feature, and it defines his long-take, documentary-style aesthetic from frame one. Shot in grainy 16mm, it follows the title character (played by regular collaborator Wang Hongwei), a pickpocket working the streets of Fenyang. It’s relatively plotless: we see his relationships with his friends, his fellow pickpockets, his family and his girlfriend, and watch as he systematically fails to maintain any of them. Meanwhile, the town he lives in appears to be in a state of collapse, with businesses closing down and the police struggling to maintain order. During the end credits, we get a caption telling us that everyone we’ve just watched is a non-professional actor, presented as if it’s a big reveal. Obviously, for someone who doesn’t speak Chinese, it’s hard to tell how much of an impact that has on the line readings. To digress wildly for a second, I recently watched the 1981 drama-documentary Take It Or Leave It, in which the band Madness re-enact the early years of their career. It really brought home to me what a fine line there is between ‘non-professional acting’ and ‘people standing in front of a camera saying things’, and how easy it is for, say, Suggs to flip-flop back and forth across that line several times in a single scene. But here, everything feels right. Even to an outsider, it’s obvious that Jia has careful control over his cast, and their reactions look genuine: the final shot, in particular, is a perfect observation of Chinese crowd behaviour. It may seem plotless, but there’s a huge sense of life at the centre of this film. Xiao Wu was filmed independently, outside of the usual state control: its view of the present-day problems in China didn’t go down entirely well with the authorities back home. But it made its way out onto the international festival circuit, and gave its director a global reputation. Three years later, when Platform (2000) was released, it was a classic case of Second Film Syndrome: the artistic clout Jia got from his small, tightly-edited film ended up being used on a rambling overblown one. All of this would be fine if Platform had been made with the same discipline as Xiao Wu. But you get the impression that exposure to an international audience resulted in Jia picking up far too many bad arthouse cinema habits. All too often, he lets his camera wander away from a scene to just look at the surroundings, which kills the pace of the movie. (It’s a baggy two and a half hours long, apparently cut down from an initial three hour release.) As people drift in and out of the group over the decade, it’s awkwardly difficult to care. Admittedly, some of the photography is beautiful, but you can’t help feeling that one of the regular motifs in the latter half of the film – the tour bus roaming aimlessly though the landscape – hits a little too close to home. In the end, Platform is too self-consciously epic for its own good, trying to hit all the key talking points of 1980s’ China and tell a story at the same time. By contrast, Unknown Pleasures (2002) aims a bit lower, and is much more successful. In the Shanxi city of Datong, two young men – Bin Bin (Zhao Wei Wei) and Xiao Ji (Wu Qiong) – are stuck in a rut of dead end jobs or no jobs at all. In a sneaky parallel with Platform, it takes a group of touring performers to jolt them out of this rut: but this is the early 21st century, so instead of singing the praises of Mao, the group is advertising Mongolian King Liquor. Xiao Ji falls heavily for the group’s dancer Qiao Qiao (Zhao Tao), but her relationship with a violent loan shark could be a sticking point. Unknown Pleasures marks the point where Jia moved to digital photography, and he uses the flexibility of the format beautifully in terms of how the camera moves and what it sees. He’s always enjoyed the imagery of people isolated in small, dingy spaces, and now he can show it without having to compromise with the lighting. And that isolation is a key theme in the film, because the three protagonists all come from the first generation born under China’s one-child policy. Unlike their predecessors in the other two movies, they don’t have an extended family to fall back on when times get tough. They only have each other, and sometimes they don’t even have that. Again, you could argue that Jia is trying too hard to please a Western arthouse audience. He throws in references to In The Mood For Love and Pulp Fiction, and even includes a scene where Xiao Wu the pickpocket attempts to buy a pirate DVD of Xiao Wu the film. (Although to be fair, that’s probably the main way a Chinese viewer would get to see it.) His historical reference points are also broadened for a foreign market, taking in the rise of Falun Gong and the announcement of the Beijing Olympics. And compared with the earlier films, this is much more of a plot-driven affair, with an obvious narrative arc and a climax that pays off on a series of themes that have been quietly set up throughout the story. As a cineliterate Westerner with a love of Asian culture, I probably should be concerned that Unknown Pleasures appears to have been made specifically to pander to me. But I’m happy to just enjoy it. That pirate DVD gag aside, it quietly plays with the ideas and themes raised in the earlier films, and neatly rounds off the picture of how Chinese society has changed since the death of Mao. Despite the sag in the middle provided by Platform – which some critics would have you believe is the highpoint of Sixth Generation cinema, so what do I know – The Hometown Trilogy is a unique document of a nation in transition. The Hometown Trilogy is out now on DVD and video on demand from Artificial Eye. Spank The Monkey blogs, tweets and picasas on Asian culture and other things. I’ve only seen Still Life, and have wanted to see The World for a while – but this trilogy could be a post-Christmas present to myself. I’d like to see what his films that use film are like – the way he uses digital in Still Life meant that the transparent look of the image actually unsettled me – maybe because on the one hand it was like TV, or maybe documentary, but also very not like that at the same time? It is unfortunate that The World did not get a wide release since it is also a high point if not the highest point of Jia’s career. Still Life may be the film that deserves the criticism you have aimed at Platform. I forgot how Unknown Pleasures refers to Pulp Fiction but PF is hardly an art house film.